So I’m nosing around one of my Friendly Local Gaming Stores (as I do, shocking as that may be) when I look over and see this creepy, black & white, old photo looking, creepy, realistic, creepy, picture of a dude with epic facial hair. I was hooked before even seeing the title. 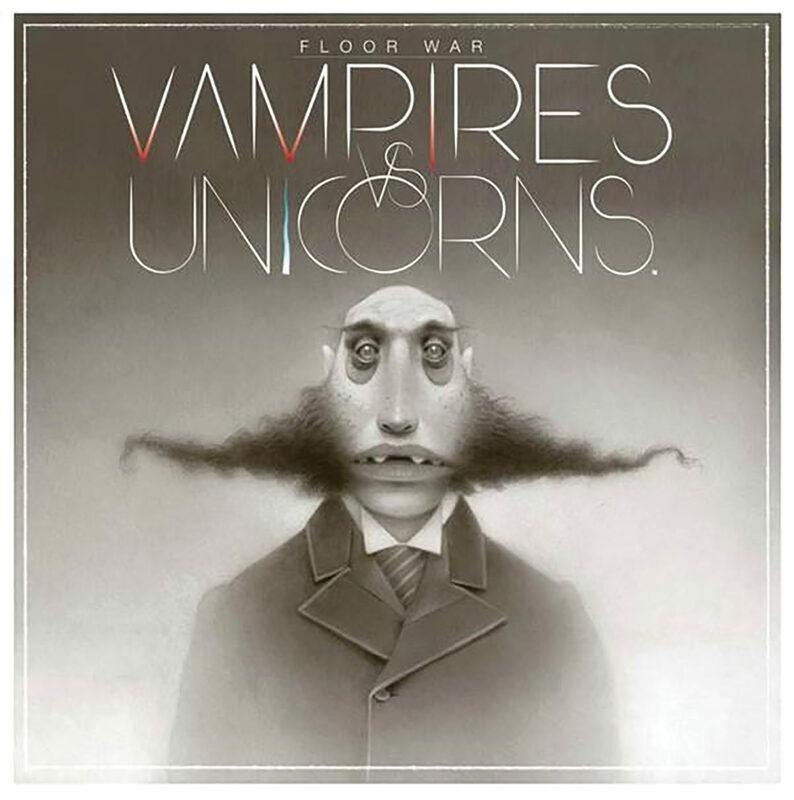 Floor War: Vampires vs Unicorns, that sounds amazing. So, it’s called “Floor War” because it is a dexterity game of flinging cards across the room at your opponent’s tiles. In front of both players, there are seven tiles, each one a bit under 8″ square. The closest tile is the player’s castle, in front of that are two more tiles that can each take two hits before being removed from play, in front of that are four more tiles that only require a single hit to remove them. To “hit” a tile, a player must throw one of their cards from behind their own castle tile, if any part of the card lands touching on top of a tile, it’s hit. The exception is the Castle. If any of the six tiles defending the castle remain in play, a card must land completely on the Castle’s tile, not just touching it. Each side has its own deck of cards, with its own unique abilities. On a players turn, they reveal the top card of their deck and take the listed action(s). The Unicorns are often able to throw multiple cards at the same time, but The Vampires may be able to throw additional individual cards if they are able to eliminate a tile. The cards come in a basic tuck box for each side, and the cards themselves are about the quality of a standard deck of cards. Sure, there are ways to make cards that will throw better, but what’s the fun in that? The tiles are all a good, thick, cardboard that should hold up to a decent amount of play. The rulebook is clear, concise, and incredibly snarky. But the truly impressive thing about this game isn’t the components, it’s the art. If you handed me a deck of cards and some simple tiles, I’d be unimpressed. But the art in this just takes the whole thing to a new level. There aren’t many games that I will call out the artists by name. A game’s art and design are always important. But this game wouldn’t be what it is without the art. Travis Louie handled the Vampire art, including the box art. The characters he portrays on the tiles all look like a very formal portrait, the sort of stereotypical painted portraits you might find along the hall of an old mansion or castle, but in the moody sepia tone of an old photograph. The Unicorn art was done by Travis Lampe and generally, I describe it as unicorns and rainbows on acid. It has a gloriously strange, surrealist, style that reminds me of Wackyland in the old 1949 Dough for Do-Do (Merry Melodies) cartoon. Seriously, if someone hasn’t already hung both sets of these tiles on their wall somewhere, I’d be shocked. This game is simple, but a ton of fun to play. I really hope that Yumfactory puts out more Floor War games, that could be interchangeable with each other.